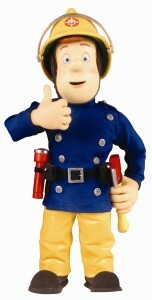 I recently came across this story out of England over a confrontation at Gatwick Airport between security and David Jones, the creator of the popular animated children’s character Fireman Sam. Jones was detained for an hour for making a comment about a Muslim woman’s hijab at a security checkpoint — a comment deemed racist by a Muslim security guard. The incident is the latest in a series of stories that have raised serious concerns over the state of free speech in England, particularly over the enforcement of hate speech and anti-religious speech (here and here and here and here and here and and here and here and here and here). He was not allowed to leave until he said that he understood how such a comment “could” have been taken to be offensive. Even if the security officers were found to have exceeded their authority, there still remain the disconcerting glimpse into what the officers thought was the applicable standard. While Jones said that he was going to file a complaint over the incident, I have not been able to find any copy of the complaint or news report since February. I hope that he does file. While many may find the comment offensive, he did not say it to the woman and is not accused of disrupting the security process. Moreover, I do not see how it is racist if that is the only thing that he said. His comment could be viewed as anti-religious or anti-Muslim. However, I fail to see why such comments are not protected speech. We are seeing a growing trend in the West toward criminalizing speech, as I have discussed in prior columns (here and here and here). This encounter, if proven, would seem a prototypical example of a speech police. “Some things are not to be said” is a chilling message for an officer to give to citizens. Even if detained for only an hour, the clear intent is to deter people from expressing unpopular or divisive thoughts. The standard for free speech is different in England, where speech has been traditionally more limited than in the United States under the first amendment. However, the loss of freedom in places like England is felt profoundly around the world. When free speech is curtailed in a place like England, it has little chance among nations with less commitment to civil liberties. Indeed, such crackdowns in Western nations serve to legitimate the actions by other countries to deny free expressions to their own citizens. The irony is that speech is now being criminalized in the name of pluralism and tolerance. Speech itself is not protected as one of those guarantees of pluralism. Western government are increasingly applying the circular logic that they will fight intolerance by warning citizens that some speech will not be tolerated. The fact that this simply creates an artificial appearance of unity does not appear to concern governments. The West seems to have grown weary of free speech. After all, less speech means less division and discord. The growing number of confrontations and arrests for speech violations leaves citizens unsure of what thoughts may be expressed. The result is obvious: a chilling effect for citizens where many avoid the risk of arrest by remaining silent. It is not that Jones’ comment was of any value to society. Indeed, it can be denounced as intolerant. However, it is his right to such speech that holds considerable value for England and other countries. You write so well, you leave me speechless. Perhaps I may recover later. Enjoyed it all. I did my 2 year service at Ft Huachuca and only came to Thailand to design B-52 bases; a civilian mercenery. My process has taken longer than yours but the view of authority and non-truth was established at ten years. CUL Got errands to do. I caught that “their/there” misspelling and corrected it. Thanks for mentioning the oversight on my part. Please feel free to bring any other errors to my attention. Perhaps expatriatism — if not ex-patriot-ism — runs in the family. My uncle fought the Germans in WWII but fell in love with German art and culture to the point where he spent most of his life as an expatriate artist livinig in Munich, Bavaria. As an old and ill man, he returned to die in America and he lies buried in a veteran’s cemetary in Minnesota. I plan on dying as a ninety-plus-year-old man (shot by a jealous husband) here in Taiwan, but as a veteran I rate having my corpse interred at a national cemetary in the United States. If a plot remains open near my mother and stepfather at Riverside National Cemetary in California, perhaps my surviing widow will send my remains there. If not, she can have me cremated and my ashes placed in the nearest Buddhist shrine. I can go either way with that. In my case, the U. S. government filled me full of lies about — and fear of — some Asian people who never did me or my country any harm. When I got overseas and actually met some of these foreigners — poor and destitute or wealthy and cultured — the lies and fear exploded. Since having my eyelids metaphorically ripped off, so to speak, I cannot ever again look away from my own government’s despicable depradations at home and abroad. I simply can’t close my eyes and lie to myself like I did as a child. And I have never in the past four decades believed one damn thing that the political, religious, and military “leadership” of America says. I learned the hard way that these corrupt impostors lie just to keep in practice; just so they won’t forget how. The miserable treatment meted out by America and Britain to Muslim peoples — over the past twenty years — does not excuse impolite reactions, intemperate language, or over-sensitive offense-taking by Muslims, of course. However, given what America and Britain have done and continue doing to the people of the Middle East, I can at least understand the justifiable resentment these people feel at the endless insults — physical and cultual — forced on at them at gunpoinit by the West. And I would hope that educated and creative Westerners would have the good grace not to make fools of themselves in public complaining about assumed “privlleges” granted to Muslim women wearing scarves. Personally, I woudl love to see more British “men” wearing Muslim women’s scarves. Just think of all the petty privileges that they would enjoy at airports as a result, and all without having to utter a single word. The bitter and surly immigration officers at LAX have detained my Taiwanese wife for up to an hour at a time, on more than one occasion, simply for residing outside the United States for a period of less than one year, the legal period that her Alien Resident Card allowed. She never said anything to anybody going through customs. We got so disgusted at the petty harassment that we let the Green Card expire and obtained a 5-year, multiple-entry visitor’s visa for her instead. Cheaper and less of a bureacratic hassle. Now the airport rent-a-goons have switched to harassing me for living overseas, even though my country sent me abroad over 40 years ago where I might not otherwise have discovered a civilized world in the first place. Thanks for leading me to your site. BTW, is there a their/there mixup in the poem? Am sure your Taiwan is more exotic than Stockholm. Particularly disliked the guided visit to the snake market and the the whorehouse hang arounds across the street who gave us looks like they were evaluating which cattle were ready for slaughter. My visits home, passing by a couple of days, on a business trip, the family interest in my life was always lacking. Wonder if there is a relationship to what you point out. Could be thay did not want to hear their were other alternatives, not only mine. As for the oath and the discussion of freedom, I’ll save that for later so as to not be overlong. Thanks for it all. next time he has to fly maybe he should wear a scarf over his face just to see if they make him remove it. I got up this morning and checked out Professor Turley’s comments about freedom of speech, which got me to thinking about Easy Rider and Invasion of the Body Snatchers. The famous scene with Donald Sutherland linked to above (from the 1978 remake of the 1956 film) came to me because I remembered the blaring, accusative headlines which greeted two members of the U.S. House of Representatives when they did not publicly enunciate certain words that many of us grew up understanding no one could force us to utter. What happens in America, not just when you say what you shouldn’t, but — even worse — when you don’t say what your government says you should. Michael Murry — great clip. The murder scene from that flic disturbs me even today. A couple of years ago we stayed in Paris for two weeks, a great neighborhood on the left bank, near markets, night life (though we didn’t do much) etc. We had a conversation with the owner of a Chocolate specialty shop, about politics etc — I mean what else do you talk about when your comparing notes? Anyway, in evaluating the pretty jagged history of the US recently he observed “but you’re a very young country”. Ain’t it the truth. Be nice if we grew up fast; our immaturity is damaging, at home and abroad. FDR said roughly that finance firms had owned the government since Andrew Jackson. Would not it be nice to know what happened up to his time. Why? Because it might cast some light on where we stand now with all our internet forums, various degrees of in- and activism, etc. Like, are our odds better now thanks to higher education, etc. or are they worse. The battle is ours, but understanding it all might help. I am not able to fully respond to each at this time … but I read each comment, especially those directed to me, and I see that you all have it down, you have it figured out. I am in the same boat as you other Americans in the 99% … we have been had … and our resistance to clean this mess up will take several generations. America will not be back for awhile. Yes I did see the story on TSA/train stations. And, yes I expect the trajectory toward increased surveillance to continue. We have a president who has done nothing to reinforce liberties, and appears to have rubberstamped and innaugerated every surveillance advancing position. So, for the present, we can’t count on leadership or pushback from the top. No surprise, if disappointing. That’s why I’ve supported OWS; they don’t seem to be kowtowing to establishment fear mongering. Per above, I would love to live long enough to witness the repeal of the Patriot Act. As for Grand Central, did you not see the post here some weeks ago about the TSA folks showing up a train stations? It’ll come. Just like the “watch for “suspicious activities”-flyers have come to small businesses and private citizens. When will they start neighborhood meetings for “security assurance” discussions. When will the first “Dial-a-terrorist” direct reporting number be published for public use? You’ve got lots to look forward to folks. Security is judging from AN’s link a growth industry. 70 percent is a large piece of the cake. And public figures on budgets can be a laugh while you choke item. Have some more coffee. When will you open up your shop? Or report those odd people who moved in recently? I checked Wikipedia, the latest on NSA electronic surveillance was posted Dec 2006. Couldn’t find better at the main NSA article. Thanks for the links. No, they have all been issued a “key” which electronically alerts the guard that he’s “green” and gets the VIP greeting. I mean your car knows your are you without you having to fumble anymore. Who arranges this? Guess who. Corporate intelligence agencies, outposts of the big ones. I continue to hope that we, as a country, will someday look back at a repealed Patriot Act and the despicable provisions of the NDAA of 2011, with the same horror and shame as was thought of the Aliens and Seditions Act. We speak of the importance of learning from history, and yet we have senators like Graham who can say such jaw-dropping and scary things as was quoted above.